Tom Ewing is a freelance writer specializing in energy and environmental topics. He has been a regular contributor to MarineLink publications for the past two years. He has extensive experience working on legislative and public policy issues, both at the state and federal levels. Voffshore wind industry, in- cluding wind towers for electricity gener- ation and the supply chain to support that extensive infrastructure and operations. The State’s big picture is ambitious: de- veloping 2,000 MW of offshore wind by 2028. 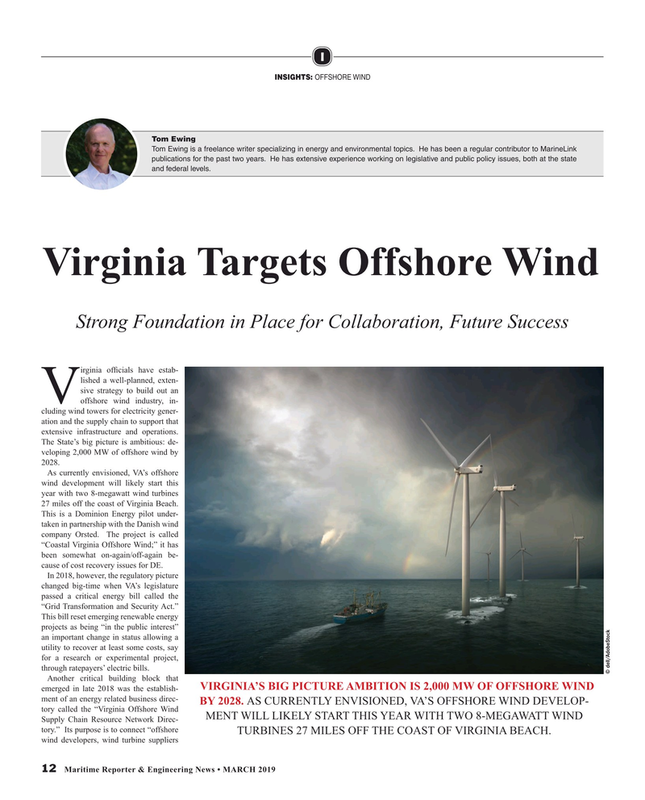 As currently envisioned, VA’s offshore wind development will likely start this year with two 8-megawatt wind turbines 27 miles off the coast of Virginia Beach. This is a Dominion Energy pilot under- taken in partnership with the Danish wind company Orsted. The project is called “Coastal Virginia Offshore Wind;” it has been somewhat on-again/off-again be- cause of cost recovery issues for DE. This bill reset emerging renewable energy projects as being “in the public interest” an important change in status allowing a utility to recover at least some costs, say for a research or experimental project, through ratepayers’ electric bills.